Established in 1969, Xantech designs and manufactures an extensive range of state of the art A/V distribution and control systems, and component products, many of which have become the de facto industry standards. Since 1969, over two million of these systems have been installed worldwide. 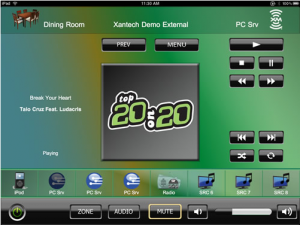 The Xantech product line includes LCD Touchpanel Controllers, multi-zone, multi-source audio/video systems, multi-zone, multi-source pre-amplifiers, multi-channel audio amplifiers, infrared receivers, remote control switchers, interface modules, IR connecting blocks, IR emitters, volume controls and IR accessories. These products are sold to professional installers and distributors worldwide. Xantech is a brand of Core Brands which is a subsidiary of Nortek, Inc. and is part of Nortek’s Technology Solutions Group. Nortek is a multinational manufacturer and distributor of building products for residential and commercial markets. Nortek, established in 1967, is headquartered in Providence, Rhode Island. Core Brands combines the product and marketing strengths of ten iconic audio, power management and control brands into a single business unit that includes ATON®, BlueBOLT®, ELAN®, Furman®, Niles®, Panamax®, Proficient®, SpeakerCraft®, Sunfire® and Xantech® brands. Core Brands has more than 190 years of combined experience in the residential, commercial and professional markets and over 4,300 direct customer accounts in multiple distribution channels in the United States and around the world.